Good News! 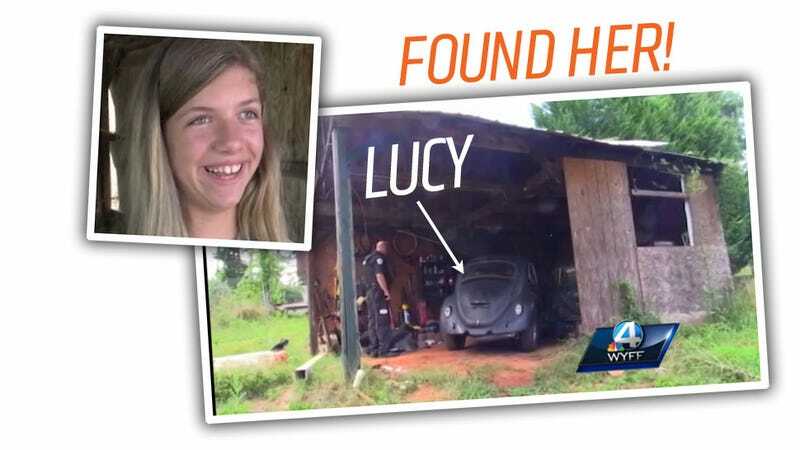 10-Year-Old Girl's Stolen Beetle Has Been Recovered! Remember last week when I told you the sad tale of the ten-year old girl who saved up two grand to buy a '67 Beetle, and then the Beetle was stolen? Well, if nothing else good happens this week, at least we have this: her Beetle has been recovered. Yes, the world just got a little bit less crappy, because young Lisa Tucker and her air-cooled pal Lucy have now been re-united. Tips from people in the community led the police to find the car in a crude carport by a house in Pelzer, SC. The likely Beetlenapper was seen running away from the house, and police are confident an arrest will be made soon. Lisa was taken to the location of her recovered car by her parents under the pretense of going out for a bite. Lisa soon realized this wasn't the case, and was delighted when she saw her prized car. The car appears to be in about the same condition it was when stolen, though the taillight lenses are missing. To be fair, I'm not 100% sure the car had them to begin with. So, congratulations on getting your Beetle back, Lisa! And good luck getting that thing all nice and ready for you to really enjoy when you turn 16. That's going to make one hell of a first car.